Ammonia used in an industrial setting is an extremely dangerous chemical that can corrode eyes, skin, and the respiratory system and poses a great risk to human health. Because ammonia is so dangerous, there are specific label requirements when it comes to marking pipes carrying the chemical. 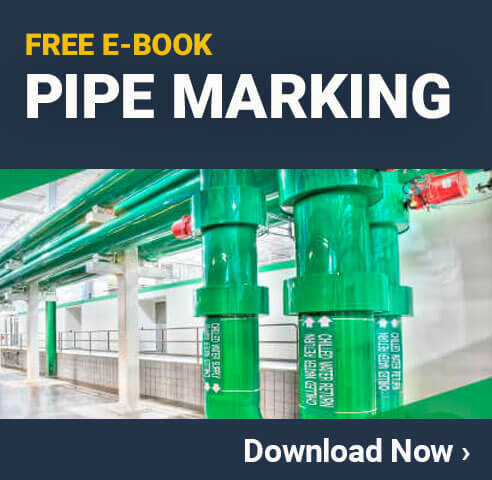 If your facility uses ammonia refrigeration piping or system components, you will need to understand to comply with process safety management requirements for ammonia refrigeration, and that includes the requirements for pipe labels. Ammonia pipe markers are more detailed than regular pipe marking labels and must meet the requirements of the International Institute of Ammonia Refrigeration (IIAR) Standards Bulletin 114. The ANSI/ASME 13.1 standards designated orange labels to be used for toxic materials and following industry standard IIAR adopted the same color to be used for ammonia pipe marking. Marker body (“AMMONIA”): The body of the label needs to be Safety Orange and the word AMMONIA must be printed in black letters. Physical state(s) (liquid, vapor, or both): To the left of “AMMONIA”, a marker is used to describe the physical state of the refrigerant. The abbreviation LIQ is used for ammonia in a liquid state and must be printed in black letters on a yellow band. If it is in a vapor state. VAP is printed on a sky blue band. In the case that the refrigerant is present in both liquid and vapor states, both are represented with the corresponding band colors. Pressure level (high or low): Indication of pressure level is represented to the right of AMMONIA. If the pressure of the refrigerant is above 70 psig, HIGH is printed in black letters on a red band. If it’s equal to or lesser than 70 psig, LOW is printed on a green band. Abbreviations for ammonia system components: Workers are able to identify and trace system piping when common piping components are listed on the label. Some abbreviations include CD (Condenser Drain), HTS (High Temperature Suction), and OD (Oil Drain). Arrow indicating flow direction: Finally, an arrow is included on the label to indicate the direction materials are flowing. The arrow needs to be in proportion to the label size itself and is usually printed on the very right side of the label. These labels must also use specific colors, as seen in the sample label on the next page. The majority of the label is orange with black text. The smaller label components (or bands) are yellow, blue, or green. While the IIAR allows pipe markers to be stenciled directly on the pipe, the best option is to use an industrial vinyl label. These kinds of labels are resistant to chemicals and water, and is designed to last for many years. Previous PostPipe Marking Text – Can It Be Abbreviated?